The total number of persons newly received by public prosecutors offices was 1,639,614 in 2009, down 61,203 (3.6%) from the previous year. The total number of persons newly received for penal code offenses had been increasing since 1998, but then turned to a decreasing trend in 2005, and was 1,035,516 (down 2.2% from the previous year) in 2009. The number of persons newly received for special act offenses has been on a decreasing trend since 2000 and was 604,098 (down 5.9% (id.)) in 2009 (Source: Annual Report of Statistics on Prosecution). Fig. 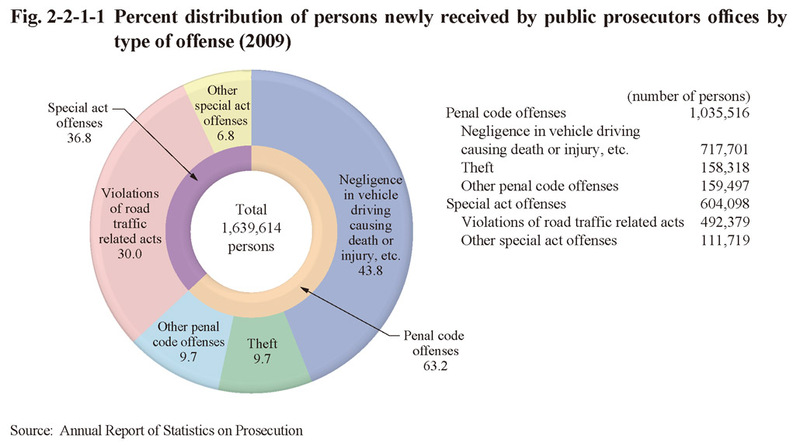 2-2-1-1 shows the percent distribution of persons newly received by public prosecutors offices in 2009 by type of offense. Of persons received for penal code offenses those received for negligence in vehicle driving causing death or injury, etc. accounted for the major part at 717,701 and the number of those received for non-traffic penal code offenses 317,815. Theft was the largest in number with non-traffic penal code offenses at 158,318, followed by embezzlement (including embezzlement of lost property, etc.) at 32,487, injury at 27,006, and fraud at 19,951. Of persons received for special act offenses the number of those received for violations of road traffic related acts was 492,379 and for special act offenses excluding violations of road traffic related acts, 111,719 (See Appendix 2-1).